An elite American military force and its links to Carrickfergus have been explored during a three-day conference. The event was hosted at the US Rangers Museum in Carrickfergus and the Northern Ireland War Memorial in Belfast. It featured renowned and highly influential speakers from across the UK and America and highlighted the history of the GIs’ time in the province. Among those who took part were two former US Rangers, one of whom was inducted into the Ranger Hall of Fame this year. 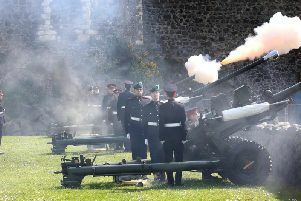 Mayor of Mid and East Antrim, Councillor Paul Reid said: “This year marks the 75th anniversary of the arrival of American forces to our shores. In January 1942, after the attack on the United States naval base at Pearl Harbor the previous month, American soldiers started arriving in Northern Ireland as they waited to be deployed for Allied counter-attacks in Europe and North Africa. “More than 300,000 soldiers were stationed here during the conflict, officially arriving at Belfast docks on 26 January 1942. “US Army Headquarters was at Brownlow House in Lurgan, under the command of Major General Russell P. Hartle, who appointed his aide-de- camp Major William O. Darby to form the 1 st Battalion US Rangers at Carrickfergus in June 1942. “We in Mid and East Antrim are hugely proud of our links to this elite American force, which remains the only US military unit to have been formed on foreign soil, and is known by its motto ‘leading the way’. “The activation of the 1st Battalion in Carrickfergus is of historical significance as the birthplace where Colonel Darby trained the first elements of the 1st Ranger Battalion. The conference, intended to appeal to those with general as well as specific interests in this crucial aspect of our shared history, included a field trip to some of the sites associated with the US presence. Chairman of Northern Ireland War Memorial, Ian Wilson, said: “The Northern Ireland War Memorial is delighted to be involved in this conference. “The charity was founded in 1947, one of its purposes being ‘a symbol of the links and friendship which had been forged between the United States of America and Northern Ireland during the Second World War’. “The War Memorial Museum in Belfast reflects this part of our shared history, and has never been busier. “Not only the greatly increased number of tourists who visit Belfast, but many local people, and especially school parties, are eager to learn of those momentous times. The conference, which took place from September 29 to October 1, was part-funded by the US Embassy in London, who gave a generous donation to the US Rangers Museum project. It was also supported by the US Ranger Association, who hosted a conference dinner during the event.